These are the collars, chests and arms where your eyes might have roamed if you’d been at Atlanta’s Synergy3. Today was a travel day and gave me an opportunity to begin to make sense of all the ideas, goodwill and plans that floated around. As I decompress, I’ll share what I saw with you. Consider this a first installment. 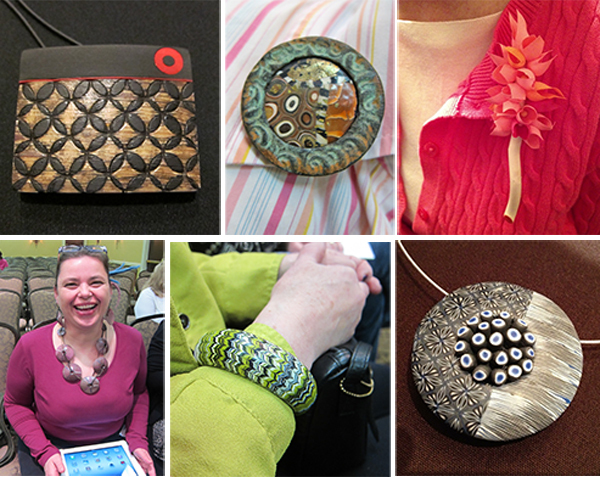 Photos here include: Pendant from Croatia’s Nikolina Otrzan, brooch from North Carolina’s Carol Parsons, Maryland’s Jeff Dever’s brooch was made with balloons. Second row: Germany’s Anke Humpert’s beads were much larger than I imagined, UK’s Carol Blackburn‘s striped bangle, hollow pendant from UK’s Cara Jane. It must have been thrilling to be with so many talented fellow artists, Cynthia! Thanks Cynthia, it was good to see you at Synergy. So many creative people and lots of ideas to bring back to London. There’ll be much to tell at our clay day next Sunday. Can’t wait for the Euro Synergy, wherever it is!